Patriot Prayer is a far-right group based in the Portland, Oregon area. Patriot Prayer describes itself as advocating in favor of free speech, and opposing big government. The group has organized pro-Trump rallies and far-right protests in predominantly liberal areas, in which it has been met with large numbers of counter-protesters. White nationalists and far-right groups, such as Proud Boys, have attended the rallies organized by Patriot Prayer, sparking controversy and violence. Patriot Prayer was founded in 2016 by Joey Gibson. Gibson says he became an activist after seeing supporters of the Trump presidency brawling with counter protesters. Patriot Prayer is a far-right group, part of the right wing of American politics. It holds rallies in areas known as centers of liberal politics. It has also been described as anti-government. The San Jose Mercury News describes Patriot Prayer as a "right-wing group ... [whose] events ... have attracted white supremacists and ended up in violent confrontations among demonstrators on both sides". In 2017 Gibson described himself as Conservative libertarian. According to the BBC, Patriot Prayer have been connected to the alt-right as well as other far-right groups. Gibson denies this, saying the group is neither white nationalist nor alt-right and that they support "freedom, love and peace". The group's stated aim is support of the First Amendment, free speech and to "liberate the conservatives on the West Coast". The Seattle Times and The Washington Post have described Patriot Prayer as a "pro-Trump group". According to The Weekly Standard, "In the early days, his [Gibson's] rallies had overtly pro-Trump themes. These days, mentions of Trump have mostly been scrubbed from his own rhetoric, as he knows even invoking the name can be alienating." Patriot Prayer has made allegations against the Council on American–Islamic Relations (CAIR) calling the group a "Muslim extremist organization". Its supporters have made threats online against CAIR, prompting an investigation by authorities. Hell Shaking Street Preachers, formerly known as Bible Believers, have associated themselves with Patriot Prayer's platform. David Neiwert, writing for the Southern Poverty Law Center blog Hatewatch, described Patriot Prayer as "trolling" the Pacific Northwest with the intention of provoking a response from far-left antifascists. Neiwert noted that Gibson denounced white supremacists and neo-Nazis during an August 13 rally in Seattle the day after the Unite the Right Rally in Charlottesville, and that Gibson also contends he has taken steps to exclude white supremacist groups. During the August 13 rally in Seattle such groups had no obvious presence; however, a week earlier at another rally in Portland, Oregon, which was led by Gibson, members of Identity Evropa were in attendance. The SPLC does not list Patriot Prayer as a hate group, nor list Gibson as an extremist. Prior to the violence at the Unite the Right Rally in Charlotteville, the Patriot Prayer rallies featured "right-wing nationalists". Since Charlottesville the group has tried to distance themselves from the alt-right. 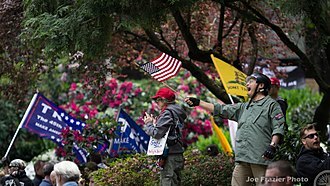 On April 2, 2017, approximately 300 people of both, supporters and opposition of President Donald Trump exchanged words, during a pro-Trump rally at Vancouver's Esther Short Park on Sunday afternoon, near Portland, but was relatively peaceful. Security for the Patriot Prayer rally, "Rally for Trump and Freedom" was provided by the 3 Percenters (often spelled III%). Following the cancellation of the rose parade due to threats of violence against the Multnomah County Republican Party who were to take part in the rally, allegedly from anti-fascist groups, Gibson organized a "March for Free Speech" to occur on April 29, 2017. Gibson told the Guardian, "We are going to continue with our rally. There is no way that we will stop. It is even more important that we come out with a strong message of love." There were an estimated 60 counter protesters and police said there had been three arrests. Jeremy Joseph Christian, who was later arrested for the fatal stabbing of two men in an apparently racially-motivated attack, was seen at the march yelling racial slurs. Gibson denounced Christian's actions and said he ejected Christian from the April 2, 2017, event due to his "bizarre behavior". On May 11 and 13, 2017, Patriot Prayer organized the attendance of a dozen "antifa watchers" at a protest at a south-east Portland grocery liquidator. Interviewed by The Oregonian, Gibson said the group were there to watch the protest and report any property damage, and that he attended "to start conversations". 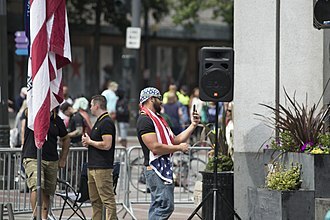 A June 4 "Trump Free Speech Rally" in downtown Portland attracted a large counter-protest and 14 people were arrested, after Portland's mayor Ted Wheeler unsuccessfully sought to have the event's permit revoked. that has held rallies from the San Francisco Bay Area According to The Washington Post, this rally provided "a vivid illustration of the city's divisions". The rally caused controversy as it was scheduled one week after the stabbings by Jeremy Christian. The mayor of Portland, Ted Wheeler had requested that federal authorities revoke the permit saying he was concerned over increasing tensions in the city due to the stabbings. The Federal Park Service denied the request, stating that the permit had been lawfully obtained weeks beforehand. The Oregon chapter of the American Civil Liberties Union's legal director, Mat Dos Santos, said it was unconstitutional of Wheeler to attempt to prevent the demonstration based on the political and personal viewpoints of those who organized the event. Gibson cancelled the event citing safety concerns. By the end of the month Patriot Prayer gathered for their "Freedom March" on June 30, 2017, at the Portland Waterfront near the annual Blues Festival, and were met by counter-protesters. The often heated exchanges of the dueling rallies ended with minimal violence and no reports of arrests. The rally occurred in the midst of a national debate on the First Amendment, one which has seen violent clashes between right-wing and left-wing groups over appearances by contentious public figures, often in liberal cities such as Portland. The atmosphere in Portland had also become tense after Christian's recent arrest for the train attack. On August 6, 2017, it was much smaller crowds for their "Freedom March" at Salmon Street Springs, Portland, but it followed the well-established pattern with a few arrests of counter protesters and a lot of shouting and chants from both the Patriot Prayer group and counter protesters. For the September 10, 2017, Portland, "Peaceful Portland Freedom March", Joey Gibson asked followers take a new non-violent approach though not all appear willing to go along. and the counter-protests also appear to be settling on a number of different measures depending on the organization. In an attempt to out-maneuver counter-protesters, Patriot Prayer switched their planned march to Vancouver, Washington, just across the river from Portland and changed the time of the event; but a small cohort of followers intend to go to the original march site to provoke the counter-protesters. In another change, this once pro-Trump organization, will now be collecting charitable relief for the victims of the recent Eagle Creek fire in the Columbia River Gorge, and the new rally is renamed, "Peaceful Vancouver Freedom March". The small rallies drew large counter-protest crowds in both Portland and Vancouver with several arrests and the detention of the driver of a pickup that sped through a crowd of counter-protesters, no injuries were reported. Among those drawn to the rallies were the militia-style Three Percenters, and the Proud Boys, a white nationalist group. On June 3, 2018, Patriot Prayer and anti-fascists again fought in parks in downtown Portland. Police arrested four people for disorderly conduct. Participants threw rocks, bottles, ball bearings, and fireworks at each other. The Portland Mercury reports that Patriot Prayer organized the rally as a counter-protest to another leftist rally led by the Empower Portland Alliance and the Direct Action Alliance. This earlier rally was intended to protest police violence and to commemorate the anniversary of an incident a year earlier when Portland police detained 200 people for several hours. In response to Patriot Prayer's plans to counter-protest this earlier rally, local antifa groups organized a counter-protest of Patriot Prayer, calling this third rally "Call to Resist Patriot Prayer Bringing Nazis to Portland." Pepper spray was used by a Multnomah County sheriff's deputy and by demonstrators. Police report that although there were several people who were evaluated medically at the parks, no one was transported to the hospital. On June 30, 2018, a Patriot Prayer rally that consisted of 150 supporters clashed with anti-fascists protesters who had been waiting for them at a barricaded street. Police observed “assaults, criminal behavior, and projectiles being thrown". Reports suggest that the counter-protesters initiated the violence when they began assaulting the Patriot Prayer supporters with thrown projectiles. Subsequently, the permit to march through downtown Portland was revoked, and the police declared the Patriot Prayer rally a riot. The police fired non-lethal ammunition towards the counter-protestors and 9 people in all were arrested. A rally called the "Gibson for Senate Freedom March", including members of both Patriot Prayer and the Proud Boys, was held in Portland on August 4, 2018, along Tom McCall Waterfront Park. It attracted counter-protestors, both from a coalition of labor unions, immigrant rights advocates, and other groups, and from organized antifa ("anti-fascist") activists. Hundreds of riot-geared policeman, from both the Portland Police and the Oregon State Police attempted to keep the two groups apart, using rubber bullets and flashbangs when protestors refused to move. At one point, the police forces came under attack from rocks and bottles. Police reported that they confiscated weapons including fireworks, long sticks, baseball bats, pepper spray and home-made shields. There were injuries, and arrests were made, but the police characterized the event as a "civil disturbance" and not a "riot". The event also featured people wearing T-shirts saying "Pinochet Did Nothing Wrong" with an image of people dropped from a helicopter and "RWDS" (Right-Wing Death Squad) both of which were also spotted in Charlottesville. In October 2018, the Portland police announced that it had found members of the organization carrying loaded firearms on the roof of a parking garage overlooking the site of the August protest; the people carrying them had concealed carry permits. The police confiscated the weapons and made the people leave the roof. On November 17, 2018, an offshoot of Patriot Prayer scheduled a Him Too rally at Terry Schrunk Plaza in downtown Portland, and was met with counter protestors. Rose City Antifa has organized opposition to Patriot Prayer rallies in Portland. In January 2019, Patriot Prayer leader Joey Gibson, Proud Boy Tusitala "Tiny" Toese and former Proud Boy Russell Schultz intitiated a campaign to tear off the bandanas of anti-fascist (antifa) demonstrators and taking pictures of their faces. The announcement of the campaign came shortly after an altercation that took place when Patriot Prayer and Proud Boys members attempted and failed to invade a chapter meeting of the left-wing organization Democratic Socialists of America. The groups clashed with anti-fascist activists nearby after being denied entry to the meeting, and claimed to be attacked. On May 1, 2017, Patriot Prayer went to counter-protest at Seattle's May Day parade with their "Stand Against Communism" rally. The events were mostly peaceful with arrests of counter protesters. On June 15, 2017, Patriot Prayer members held a rally at Evergreen State College, timed to coincide with one by the Evergreen Anti-Fascist Community Defense Network. The former promoted solidarity with Bret Weinstein, whose critical comments about an event for racial awareness had ignited campus protests. One arrest was made at the event after the vehicles of the group leader Joey Gibson and one other person had their tires slashed, allegedly by a member of antifa. On August 13, 2017, the group held the "Freedom Rally Seattle" at Westlake Park with a large police presence to keep thousands of counter-protesters away. The concurrent events came one day after the death and injuries in Charlottsville and tensions were high with arrests of counter protesters made by police. On February 10, 2018, Patriot Prayer were invited by the University of Washington College Republicans to speak at their "Freedom Rally" in Red Square. Several groups organized counter-protests, leading to skirmishes. Five people were arrested. A rally which was to be held at Crissy Field in San Francisco on August 26, 2017 was cancelled by Gibson. In response to allegations by Nancy Pelosi that the event was intended to be a "white supremacist rally", Gibson said "For those of you who believe we are seriously going to throw a white nationalist supremacist rally in San Francisco, it's time for logic," In a video posted to his Facebook page Gibson said, "We have a black speaker, two Hispanic speakers, we've got an Asian, a brown speaker right here (referring to himself) – we got a transsexual, and we aren't talking about race." Security for the event was to be handled by the Oath Keepers. On August 26, 2017, news of a planned Patriot Prayer press conference in San Francisco's Alamo Square Park drew over 1000 counter-protesters to the neighborhood. The group, which had already canceled a planned a rally at Crissy Field due to safety concerns, held the press conference in Pacifica instead. Prior to the event, the group's leader, Joey Gibson, denounced white supremacists before an August 2017 rally, saying "Don't show up, you're not welcome." Group organizers arrived at Crissy Field later that afternoon to talk with counter-protesters. A September 26, 2017 Patriot Prayer demonstration near Sproul Plaza resulted in violence between the group and left-wing activists, including By Any Means Necessary (BAMN). The demonstration continued in a march to People's Park, where Kyle "Stickman" Chapman, a self-described American nationalist claimed there was "a war on whites" and a "battle for Berkeley". Police made three arrests, including Yvette Felarca. In February 2019, Willamette Week reported that Portland police lieutenant Jeff Niiya kept in close touch with Gibson, passing on to him intelligence about the anti-fascist movement in the city. He also advised Gibson on how a Patriot Prayer member could avoid being arrested. The Portland Police Bureau (PBB) announced that they were beginning an investigating into the relationship between the office and Gibson. On February 21, a public "listening session" convened by the PBB consisted in large part of strong criticism of the bureau. The Guardian also reported that in December 2017, Lt. Niiya told Gibson that the police would not execute a warrant for the arrest of Toese. In a text, Niiya wrote "Just make sure he doesn’t do anything which may draw our attention. ... If he still has the warrant in the system (I don’t run you guys so I don’t personally know) the officers could arrest him. I don’t see a need to arrest on the warrant unless there is a reason." He also indicated that police officers had ignored previous arrest warrants for Toese. ^ "Right-Wing Slugger "Tiny" Toese Arrested Again While Trolling Portland". Willamette Week. Retrieved December 11, 2017. ^ a b c May, Patrick (August 23, 2017). "Who's behind this weekend's right-wing rally at Crissy Field?". Mercury News. Retrieved September 25, 2017. ^ a b Kelly, Heather (August 27, 2017). "San Francisco marchers celebrate canceled 'free speech' rally". CNN. Retrieved September 4, 2017. ^ "1,000+ expected at Portland protests Sunday; 'Patriot Prayer' leader changes location". KATU News. September 10, 2017. Retrieved December 12, 2017. ^ Westervelt, Eric (August 25, 2017). "Bay Area Braces For Protests: 'Charlottesville Has Raised The Stakes'". NPR News. ^ Hansen, Kristen (June 4, 2017). "14 arrested as pro-Trump rally draws massive counter-protests in Portland". Chicago Tribune. Associated Press. Retrieved September 26, 2017. ^ Weise, Elizabeth (August 27, 2017). "'Patriot Prayer' organizers in San Francisco blame left for violence". USA Today. Retrieved September 24, 2017. ^ Nouvelage, Elijah (August 27, 2017). "'Victory': Thousands protest far right in San Francisco". Al Jazeera. Retrieved September 3, 2017. ^ Wilson, Jason (August 5, 2018). "Portland far-right rally: police charge counterprotesters with batons drawn". the Guardian. The Guardian. Retrieved November 25, 2018. ^ Bivins, Mike (June 5, 2017). "Alt-right rally draws protests in Portland, Oregon". Aljazeera. ^ a b Matarrese, Andy (September 10, 2017). "Protesters clash in Patriot Prayer demonstration on Vancouver waterfront". The Columbian. ^ a b c Shepherd, Katie. "Police in Vancouver Arrest Man for Nearly Running Down Antifa Protesters With His Truck". Willamette Week. ^ "San Francisco shuts down 'Patriot Prayer' rally by walling off city park". Fox News. Associated Press. August 26, 2017. Retrieved September 24, 2017. ^ a b Matarrese, Andy; Dake, Lauren (July 2, 2017). "Joey Gibson aims to 'liberate conservatives' via his Patriot Prayer group". The Columbian. Retrieved September 24, 2017. "Far-right Patriot Prayer clashes with anti-fascists in Portland". Al Jazeera. Retrieved July 2, 2018. ^ Har, Janie (August 26, 2017). "Right-wing groups cancel San Francisco Bay Area rallies". AP News. ^ a b BBC (August 26, 2017). "San Francisco rally is cancelled by right-wing group". BBC News. Retrieved September 24, 2017. ^ Levin, Sam (October 3, 2017). "Free speech rally at UC Berkeley draws hundreds, moves to People's Park". The Daily Californian. Retrieved October 8, 2017. ^ Schweigert, Keith (August 28, 2017). "13 arrested during clashes at dueling protests in Berkeley, California". Fox 43 News. ^ Wong, Lonnie (August 23, 2017). "Rapper Work Dirty Prepares for Patriot Prayer Rally in San Francisco". Fox 40 News. ^ Kelly, Heather (August 26, 2017). "San Francisco marchers celebrate canceled 'free speech' rally". CNN News Alerts. ^ "Joey Gibson aims to 'liberate conservatives' via his Patriot Prayer group". July 2, 2017. Retrieved August 7, 2018. ^ Calandra, Lion (August 23, 2017). "Adopt-A-Nazi is Jewish group's answer to 'Patriot Prayer' rally". Fox News (August 23, 2017). Retrieved October 3, 2017. ^ Seattle Times (August 13, 2017). "Here's how downtown pro-Trump and anti-Trump demonstrations unfolded". Seattle Times. Retrieved October 8, 2017. ^ Phillips, Kristine (August 27, 2017). "Pro-Trump group cancels San Francisco rally as hundreds of counterprotesters march on the streets". Washington Post. Retrieved October 8, 2017. ^ Labash, Matt (September 11, 2017). "A Beating in Berkeley". Weekly Standard. Retrieved October 8, 2017. ^ Shepard, Katie (November 12, 2018) "Apparel Company Boots Patriot Prayer and Refuses to Continue Selling their Merchandise" Willamette Week. Retrieved: January 17, 2019. ^ Sparling, Zane (November 4, 2018). "Muslim advocacy group threatened on Patriot Prayer page". Portland Tribune. Retrieved January 17, 2019. ^ Shepherd, Katie (August 31, 2017). "Preacher Aligned with Portland-Area Far-Right Group Promises "Bloodshed" at Future Rallies". Willamette Week. Retrieved February 8, 2019. ^ Brown, Doug (April 17, 2017). "VIDEO: Pro-Trump Oregon Street Preacher Kicks Guy at Crazy Berkeley Rally". Portland Mercury. Retrieved February 8, 2019. ^ June, Sophia (January 30, 2017). ""You're Going to Hell," Belligerent Men Screamed at Portland Parishioners Outside of a Spanish Mass". Wilamette Week. Retrieved February 8, 2019. ^ Neiwert, David (August 25, 2017). "What You Need To Know About Saturday's 'Patriot' Rally In San Francisco". Hatewatch. Southern Poverty Law Center. Retrieved October 3, 2017. ^ Lanktree, Graham (August 17, 2017). "U.S. Authorities Consider Shutting Down Hard-Right Rallies After Charlottesville". Newsweek. ^ Neiwert, David (August 15, 2017). "Crowd of protesters heavily outnumbers alt-right 'Patriot' supporters, but critics welcomed onstage, violence is minimal with shift in tone". Hatewatch. Southern Poverty Law Center. Retrieved October 5, 2017. ^ a b Wallace, Christopher (August 23, 2017). "San Fran park braces for 'Patriot Prayer' rally amid fears of challenges from all sides". Fox News. Retrieved August 25, 2017. ^ "Alt-right protest organizer: 'Mayor will not convince me to cancel the rally'". Komo News. May 30, 2017. ^ "Police: Federal reinforcements necessary for alt-right rally following stabbing". Komo News. June 1, 2017. ^ Elias b, Paul (2017). "Tense, peaceful exchanges among Berkeley rallies protesters". Komo News. ^ Mehlhaf, Nina (2017). "Tracking the white supremacy movement in Oregon". KGW 8 News. NBC News. ^ Matarrese, Andy (April 2, 2017). "Trump rally guests, protesters square off in Esther Short Park". The Columbian. ^ Hawkass, Johnathan (April 4, 2017). "Clark County Trump rally disrupted by anarchists". The Reflector. ^ Brown, Doug (April 2, 2017). "Photos & Video: Protesters Arrested at a Donald Trump Rally in Vancouver". The Portland Mercury. ^ Mettler, Katie (April 27, 2017). "Morning Mix Portland rose parade canceled after 'antifascists' threaten GOP marchers". Washington Post. Retrieved October 1, 2017. ^ Pein, Corey (April 26, 2017). "Right-Wing Group Plans "Free Speech" March In Wake Of East Portland Parade Cancellation". Willamette Week. Retrieved October 1, 2017. ^ a b c Wilson, Jason (May 29, 2017). "Portland knife attack: tension high as 'free speech rally' set for weekend". The Guardian. Retrieved November 21, 2017. ^ Vespa, Maggie (April 30, 2017). "Conservative march, counter protest forms in wake of canceled parade". KGW-TV. NBC News. Retrieved October 1, 2017. ^ a b "Portland pro-Trump rally organizer: 'I can't control everybody'". CBS News. May 31, 2017. ^ Campuzano, Eder (May 12, 2017). "Dozens turn out to protest, bicker over Confederate flag in Southeast Portland". The Oregonian. ^ Urbanski, Dave (May 16, 2017). "Antifa punk tries blocking big guy wearing 'In God We Trust' shirt at protest — and pays for it". The Blaze. ^ a b Sottile, Leah (June 4, 2017). "Right-wing free speech rally draws massive counterprotests in Portland". The Washington Post. ^ a b Hansen b, Kristena (June 4, 2017). "14 arrested as pro-Trump rally draws massive counter-protests in Portland". Chicago Tribune. The Associated Press. ^ Matier, Phil (August 21, 2017). "Entire San Francisco Police Force To Work During Patriot Prayer Rally". CBS SF Bay Area News. ^ Sylvester, Terry (June 4, 2017). "Trump supporters confront counter-protests in Portland, Oregon". Reuters. Retrieved September 30, 2017. ^ Katu News (June 4, 2017). "'Trump Free Speech Rally' set in downtown Portland a week after deadly MAX stabbing". KATU News. Retrieved October 1, 2017. ^ Bhattacharjee, Riya (August 25, 2017). "Tomorrow Feels Like a Set-Up:' Conservative Group Patriot Prayer Cancels Free Speech Rally in SF". NBC News. Retrieved September 24, 2017. ^ Douglass, Joe (July 1, 2017). "Pro-Trump and anti-fascist demonstrators square off near Waterfront Blues Festival". KATU 2 News. ^ Dymburt, Andrew (June 30, 2017). "Patriot Prayer, Antifa face off in violent protest". KOIN 6 News. ^ "Violence breaks out at protests near Waterfront Blues Festival". The Oregonian. June 30, 2017. Retrieved October 31, 2017. ^ Hawkins, Derek (May 30, 2017). "Portland mayor asks feds to bar free-speech and anti-sharia rallies after stabbings". The Washington Post. ^ Kaleem, Jaweed (June 2, 2017). "Portland braces for violence at pro-Trump rally this weekend after white supremacist is charged with murder". The LA Times. ^ Sailor, Craig (June 3, 2017). "Portland braces for dueling protests that could turn violent Sunday". The Olympian. ^ Dowling, Jennifer (2017). "Opposing groups clash in downtown Portland". KOIN News. ^ Neiwert, David (August 7, 2017). "Protest of 'left-wing violence' in Oregon draws small crowds as police make their presence scarce, leaving both sides to just shout at each other". Southern Poverty Law Center. ^ Shepherd, Katie (August 31, 2017). "Preacher Aligned with Portland-Area Far-Right Group Promises "Bloodshed" at Future Rallies". Willamette Week. ^ "Multiple rallies planned Sunday in downtown Portland". KGW 8 News. September 8, 2017. ^ "Portland braces for white nationalist protests Sunday". KION 6 News. September 8, 2017. ^ Brown, Doug (September 8, 2017). "Big Police Presence Expected at Sunday's "Patriot Prayer" Rally and Counter Protest". The Portland Mercury. ^ Kavanaugh, Shane Dixon (September 9, 2017). "Portland protest leader Joey Gibson moves 'Patriot Prayer' rally expected to draw large counter demonstrations downtown". Oregonlive. ^ Vespa, Maggie. "Truck speeds between group of protesters in Vancouver". KGW 8 News. ^ Schulberg, Jessica (September 14, 2017). "Man Accused Of Trying To Mow Down Antifa With Truck Claims It Was A Misunderstanding". Huff Post. ^ Flaccus, Gillian (June 9, 2018). "Violent protests again draw attention to Portland, Oregon". USA Today. Associated Press. Retrieved June 9, 2018. ^ "Antifa and Patriot Prayer demonstrators clash in downtown Portland; 4 arrested". OregonLive.com. Retrieved June 9, 2018. ^ "What We Got Wrong About Last Weekend's Violent Rallies". Portland Mercury. Retrieved June 9, 2018. ^ Politi, Daniel. "Arrests Made as Right-Wing Protesters, Anti-Fascists Fight in Portland Streets". Retrieved August 7, 2018. ^ "Patriot Prayer marches through downtown Portland, police declare march a riot". kptv.com. Retrieved June 30, 2018. ^ "Riot in Portland as far-right marchers clash with anti-fascists". The Guardian. Retrieved July 1, 2018. ^ Flaccus, Gillian (August 3, 2018). "Portland prepares for right-wing, anti-fascist rallies". Associated Press via The Sacramento Bee. Archived from the original on August 4, 2018. ^ LeBien, Mark; Stapleton, AnneClaire (August 4, 2018). "In Portland, protesters hurl projectiles, police say 'disperse'". CNN. Retrieved August 4, 2018. ^ Stanglin, Doug; Hayes, Christal (August 4, 2018). "Portland protests: Police use flashbangs at right-wing rally that drew counter-protesters". USA Today. Retrieved August 4, 2018. ^ Sottile, Leah (August 4, 2018). "Protests again convulse Portland, Ore., as groups on the right and left face off". The Washington Post. Retrieved August 4, 2018. ^ Zielinski, Alex (October 15, 2018). "Members of Patriot Prayer Brought Loaded Firearms to Roof Before August Protest". Portland Mercury. ^ "Proud Boy Threatens Portland Mayor: 'I'm Coming For You'". Southern Poverty Law Center. January 25, 2019. Retrieved January 30, 2019. ^ Anapol, Avery (January 29, 2019). "'Proud Boys' threatens Portland mayor in Facebook video: report". TheHill. Retrieved January 30, 2019. ^ Wilson, Jason (January 29, 2019). "Portland: far-right activist threatens mayor as groups change tactics". The Guardian. ISSN 0261-3077. Retrieved January 30, 2019. ^ Morton, Neal (May 2, 2017). "Riots mar May Day in Portland and Olympia. In Seattle? Light up the 'peace joint'". The Seattle Times. ^ "One arrested after pro & anti-Trump demonstrators clash at Evergreen State College". Komo News. June 16, 2017. ^ Neiwert, David (June 16, 2017). "Evergreen State Protest By 'Patriot' Group Dwarfed By Angry Response". Southern Poverty Law Center. ^ Bancalari, Kellie (June 30, 2017). "Evergreen State College looks to mend campus following protests". USA Today. Retrieved August 30, 2017. ^ Cohen, Stephen. "Police pepper spray, keep marchers away from right-wing group". PI newspaper. ^ "Live Feed". Kiro 7 News. August 13, 2017. ^ "Here's how downtown pro-Trump and anti-Trump demonstrations unfolded". Seattle Times. August 13, 2017. ^ "Photos: Anti-Nazi group rallies in downtown Seattle". Komo News. August 24, 2017. ^ Walters, Kate (February 10, 2018). "Protest and arrests at UW College Republicans rally Saturday". KUOW. Seattle. Retrieved February 10, 2018. ^ CBS News b (August 23, 2017). "Park Service OKs San Francisco Crissy Field Permit For Patriot Prayer, Counter-Protests". CBS News. Retrieved September 24, 2017. ^ a b "Rightwing group protests cancellation as San Francisco blocks rally venues". The Guardian. Associated Press. August 25, 2017. Retrieved September 24, 2017. ^ Wildermuth, John (August 17, 2017). "Crissy Field rally group has history of provoking fights". San Francisco Chronicle. Retrieved October 1, 2017. ^ Fitzgerald Rodriguez, Joe (August 18, 1917). "Oath Keepers confirm militia will attend controversial Crissy Field rally". San Francisco Examiner. Retrieved January 3, 2018. ^ Wong, Julia Carrie (August 25, 2017). "Party poopers: rightwing rally cancelled in San Francisco amid dog poo protest". The Guardian. Retrieved August 26, 2017. ^ Kavanuagh, Shane (August 24, 2017). "Patriot Prayer leader Joey Gibson takes his protest to San Francisco". The Oregonian. Retrieved August 25, 2017. ^ "After San Francisco and Berkeley rallies are scrapped, counter-protesters take over the streets". Los Angeles Times. August 26, 2017. Retrieved August 26, 2017. ^ "3 arrested in Berkeley during Patriot Prayer march". KRON 4 News. September 26, 2017. ^ Veklerov, Kimberly; Tucker, Jill (September 26, 2017). "Fights break out between right, left as dozens march through UC Berkeley". San Francisco Chronicle. Retrieved September 26, 2017. O'Sullivan, Joseph (June 16, 2017). "Counter-protesters clash with pro-Trump group Patriot Prayer at Evergreen State College". The Seattle Times. Retrieved September 24, 2017. Steinmetz, Katy (August 25, 2017). "A Right-Wing 'Free Speech' Rally Planned for San Francisco Has Been Cancelled". Time. Retrieved September 26, 2017. This page was last edited on 15 April 2019, at 10:02 (UTC).